The Job Fair is open to anyone 16 years old and older. Anyone looking for a job or thinking about changing jobs is encouraged to attend. 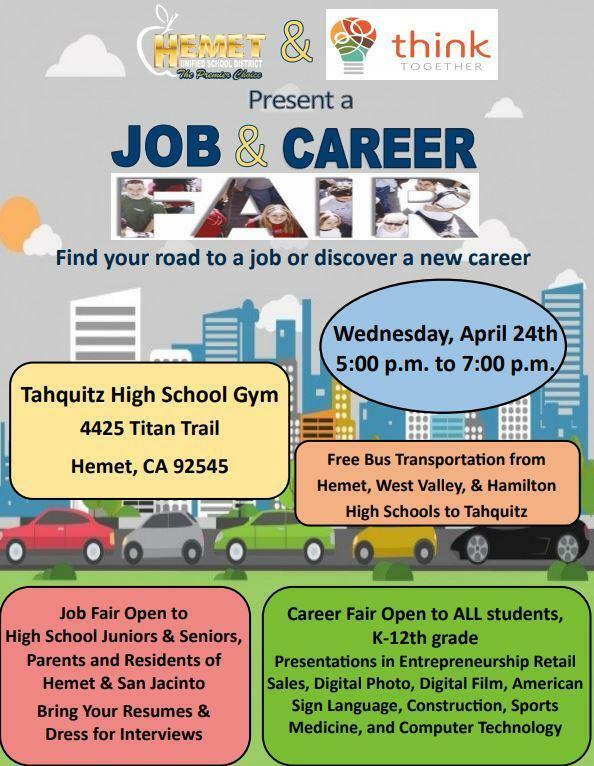 The event is open to all adults in the Hemet - San Jacinto valley area, in addition to Anza, Cottonwood, Idyllwild and surrounding areas. There will be an area for employers who want to conduct pre-screening interviews. There will also be an application center with staff to assist adults in completing any online applications that evening. The staff at the Application Center can also assist adults in creating resumes. Adults who attend the Job Fair should come dressed for an interview and bring copies of their resumes.